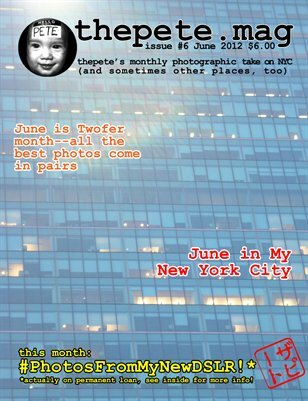 In honor of the month of Gemini--er--June, it's twofer time with the best photos of NYC taken by thepete coming in pairs! Buildings, parks, skies--NYC at it's most breathtaking! (New Jersey's in there, too--what? It's just across the river!) All full-page photos, this month, were taken with an adult-sized camera with an adult-sized lens! Photos, sure to please! Not into photos of the Big Apple? Well, why not support thepete? Grab the digital version for just a skinny buck! You can afford $1, cantcha? THANKS! !